I was really skinny growing up - I gained the "Freshman 15" my first year of university (thanks to my meal card) and I was still slim. Two decades and two kids later, I have myself a muffin top. It has taken me a while to come to terms with that lovely fleshy roll (about the last decade actually) but I finally decided to just buy higher jeans. My thanks to American Eagle Outfitter high-waisted jeggings! 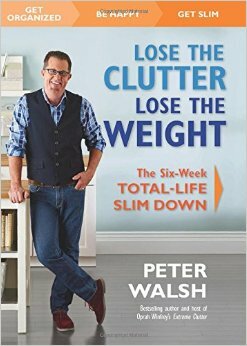 I was excited to review Peter Walsh's Lose the Clutter, Lose the Weight: The Six-Week Total-Life Slim Down because I had previously seen Walsh on the Oprah show and enjoyed his approach to de-cluttering homes. Losing weight has never been a focus for me but I find the connection between clutter in the home, excess weight and a cluttered mind fascinating. "People struggling with too-heavy bodies and overstuffed homes often have heavy mental and emotional burdens, too. This is also a type of clutter, even though it's not as visible as the clutter in our homes and on our hips," says Walsh in the intro to Lose the Clutter, Lose the Weight. I believe that there is indeed a relationship between the clutter in our homes, how we function in our lives and how satisfied we are. Which problem contributes to the other may not be clear, but it's likely they each cause their own troubles - a co-dependent relationship if you will. "If the stuff you own is not helping you create the life you want, then let it go," recommends Walsh. That has certainly been a focus in our home this past year. Lose The Clutter, Lose The Weight is a step-by-step manual "that helps you deal with the physical clutter that's invaded your home, the food choices that have led to extra pounds, the lack of exercise that has left you less fit than you'd wish, and the lack of focus that keeps you from living the fullest, richest life possible." Walsh offers a very specific, actionable 6-week program to make a significant change. I find the book interesting and readable. It's broken up into smaller sections so it never gets boring. There are surveys to help you measure your clutter problem, your anxiety and any emotional eating patterns. There are tips on mindfulness. There are sections detailing the experiences of people who have tried the 6-week program. And then there's the program itself, with specific exercises (in photographs), foods and de-cluttering steps (room by room) for each week. I highly recommend this book for those who are ready to make a change in 2016. Buy Lose the Clutter, Lose the Weight: The Six-Week Total-Life Slim Down in the U.S. Buy Lose the Clutter in Canada. While the diet plan in Lose The Clutter, Lose The Weight is geared to moving people on "ordinary" diets towards healthier eating, (ie. there are lots of meat options and convenience items) The Detox Prescription: Supercharge Your Health, Strip Away Pounds, and Eliminate the Toxins Within offers an eating plan that is, in my opinion, a more advanced option for healthy eaters. The book outlines a 3-day juice, homemade nut milk and smoothie cleanse. From there it moves on to four days of fully vegan eating. For those who wish to continue, there are then two weeks of mostly vegan menus, with the addition of limited amounts of fish, eggs and dairy. 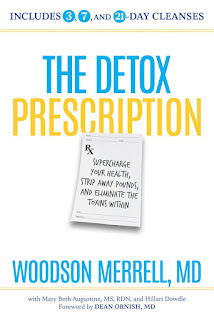 Author Woodson Merrell, MD, recommends continuing with the program for the full three weeks. "The ideal detox is a way of life. It is taking the time to adopt new habits that mean never getting toxic in the first place. And 21 days is the perfect amount of time to do that. First the book looks at toxic triggers that affect those of us in first-world countries - overwork, lack of sleep, convenience foods, household cleaning products and wheat among them. There are medical and environmental factors questionnaires to help you establish your level of toxicity. The book aims to reset your body, mind and spirit through eating, light yoga, meditation and sleep hygiene. 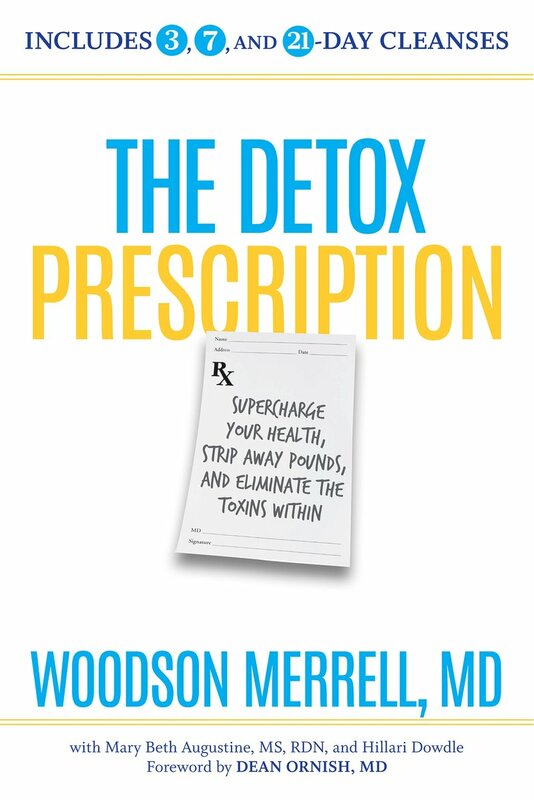 For where I'm at with my eating, I could see The Detox Prescription offering more opportunity for improvement. Of course, I will be sticking with the vegan options only. And actually, author Woodson Merrell notes, "I'll stick with what I said about a vegan diet being the healthiest; it really is." Knowing that some will struggle with veganism, he offers a flexitarian approach. For those who have already developed a disease process such as high blood pressure or diabetes, though, he recommends the vegan diet as a powerful health improver. I really like this book too. There is a specific menu (with recipes) for every single day of the plan, and every meal, so you are never left to wonder what you should make. Red Quinoa-Avocado Salad, "Creamy" Garlic Soup With Spinach, Baked Acorn Squash With Apples and Walnuts - they are simple, whole foods recipes that won't take a huge amount of effort. To be honest, I probably won't do the 3-day "turbo cleanse" any time soon. The juices, smoothies and nut milks sound incredible but I'm the type of person who gets shaky with hunger after three hours without food. I would definitely try a number of these recipes and maybe attempt one day of the 3-day cleanse. And I would use many of the recipes suggested throughout the 21-day plan. In other words, I think the book is useful even if you don't intend to exactly follow the plan. Buy The Detox Prescription in the U.S. Buy The Detox Prescription in Canada. Read On To Enter To Win These Two Fab Books! 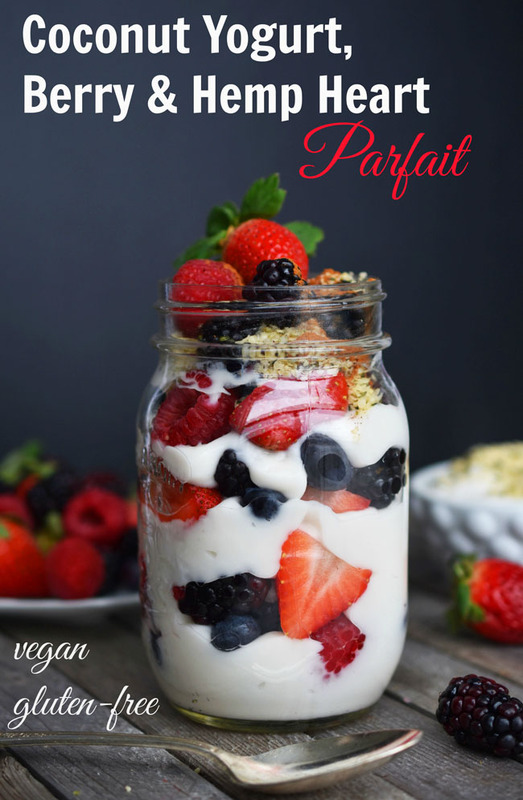 This Coconut Yogurt, Berry and Hemp Heart Parfait is breakfast for day 5 of the detox diet, after the three smoothie and juice days, during the following four fully vegan days. 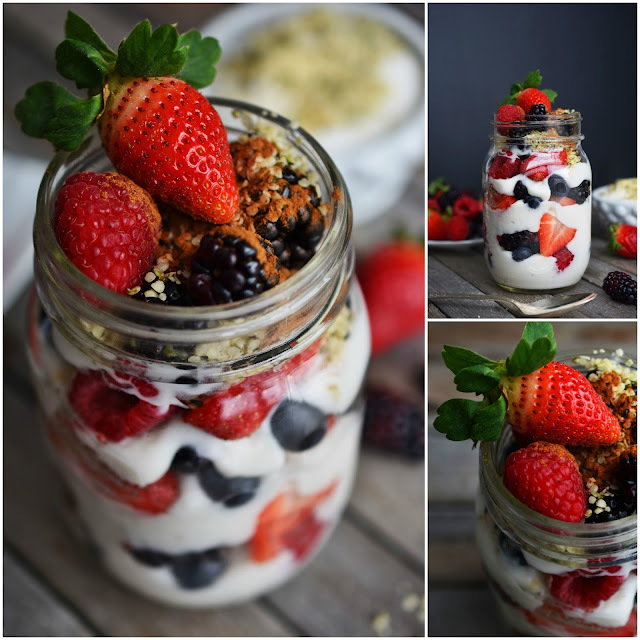 From the intro in the book: "This colorful parfait really brightens up your morning, while the hemp hearts add heartiness and contain the powerful phytochemicals ellagic acid and resveratrol, which reduce inflammation, inhibit oxidation of LDL (“lousy” cholesterol), protect nerve cells, and prevent insulin resistance. Berries have a lot less sugar by weight than many other fruits, and what sugars are there are released relatively slowly due to the 10 grams of fiber. In a small bowl, mix the berries together. In the bottom of a serving bowl, layer 1/3 cup of the berries. Top with 1/3 cup yogurt, another 1/3 cup berries, 1/3 cup yogurt, another 1/3 cup berries, 1/3 cup yogurt, and the last 1/3 cup berries. Sprinkle the hemp hearts on top of the finished parfait. Sprinkle with the cinnamon and nutmeg (if using). Tip: Berries can be expensive; use any combination here. You can also use thawed frozen berries—just be aware that the texture will change. Remember to rinse frozen produce just as you do fresh. Coconut milk yogurt is a great nondairy alternative for people who are cow milk protein or lactose intolerant. 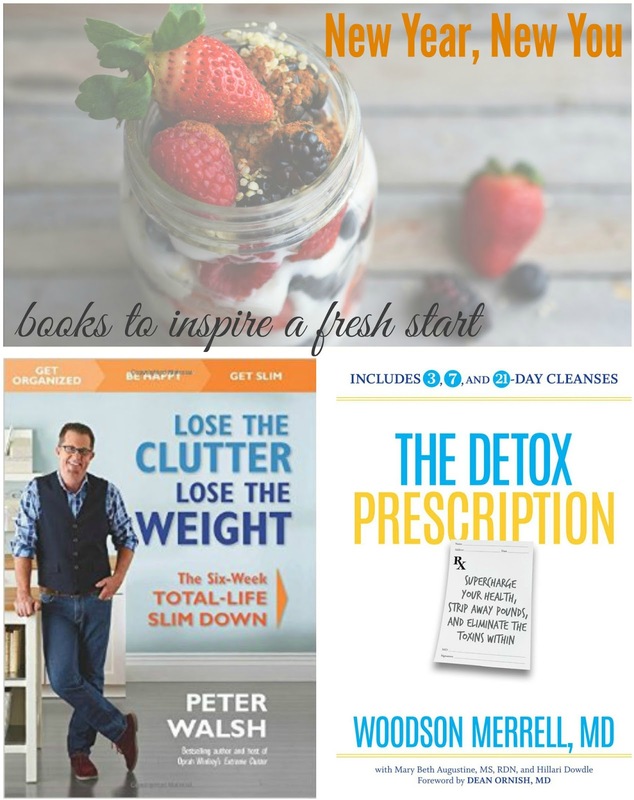 Enter to Win The Detox Prescription & Lose The Clutter, Lose The Weight! Residents of Canada (18+) may enter to win these two great motivational books from Raincoast Books. Use the rafflecopter widget below until January 31st. I love the tips as well as the great recipes. They offer advice on subjects I could use a little help with right now. I am always interested in different approaches to weight loss. This year I am focused on clutter! I am always trying to learn mmore about what is the healthiest food to eat so I think these books could help. They will be inspiring and motivational and help with my decision to be healthier! I am working on this year making healthier choices food wise. This would be great. I'd love to read Lose The Clutter, Lose The Weight. I've never thought of the connection between the two issues before but they are both issues I'm trying to deal with right now. Please disregard my entry into "share this giveaway" I think I put my tweet link in there accidentally.